So why the special attention? It’s safe to say that I am drawn to older structures that are able to tell a story without needing a written word. Having said that, this building has a lot of character. From its weathered wooden siding, to its broken windows. The fact that it is still nearly perfectly upright after all these years is a testament to its strength – both physical and metaphysical. For as much as this building looked determined to stay standing, it took a certain amount of determination to make this photograph. Apart from being able to get here on a blue sky day with fresh snow on the ground, it took 3 layers of clothing and a pair of snowshoes to deal with the environment (-12°C with 48km/hr gusts), and required hauling a backpack full of gear and a tripod to boot. I had fun doing it though! This was my grandparent’s house. 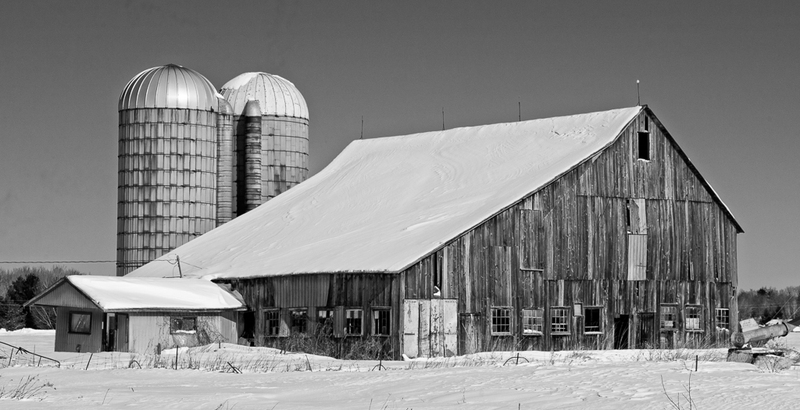 The barn was torn down this year as the farm was sold. Thank you for taking such a lovely photo. Thank you Janet. I hope that your grandparent’s property provided a lot of great childhood memories.